This blog post has been literally years in the making. Although I’ve happily moved back home to Texas, the city of Santiago de Compostela in far northwestern Spain gave me two of the best years of my life. I spent much of that time drinking an expertly-pulled café con leche, indulging in a fresh butter croissant (or two), and going out for tapas with friends in the old town. I cooked most of my meals at my apartment, but that’s not to say I didn’t gain an intimate knowledge of the cafés, bars, and restaurants in the Galician capital. Whether you’re a freshly-arrived pilgrim weary of the Camino, or a visitor with limited time to spare, I hope these recommendations that I’ve curated below will help you avoid the tourist traps on Rúa do Franco south of the cathedral and instead get an authentic experience in one of Spain’s most alluring cities. A clean, comfortable café south of Praza de Galicia with a large outside terrace for people-watching on the busy Hórreo street. Come here for good coffee and the morning paper. Their fresh-squeezed orange juice is the best in town. Tucked away in a side-plaza near the Porta do Camiño (where pilgrims first enter the old town on the Camino de Santiago), Bicoca serves a brunch every Sunday that is up to American standards. I love their Galician interpretation of eggs Benedict: a slice of toasted country bread with Spanish cured ham, plus the poached eggs & Hollandaise sauce. With several locations around town, this local chain churns out quality pastries and fries their own churros in house, plus they have great coffee and loose-leaf teas. If you want tarta de Santiago, go here to try a slice. One of my all-time favorite haunts in Santiago: cozy coffee shop feel, fun wallpaper, comfy seats, nice music, and soft lighting. 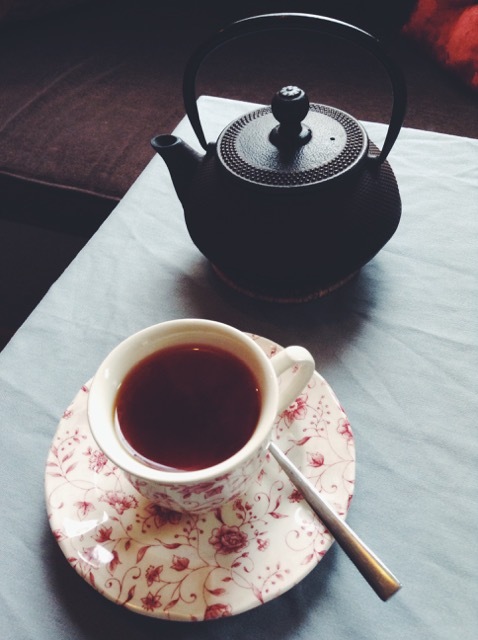 They serve their smooth cafés con leche in fun, unique tea cups, and brew their loose-leaf teas in separate metal teapots. Tertulia also has an extensive breakfast menu, from rustic toasted bread and grilled croissants with butter and jam to bacon, eggs, and pancakes! 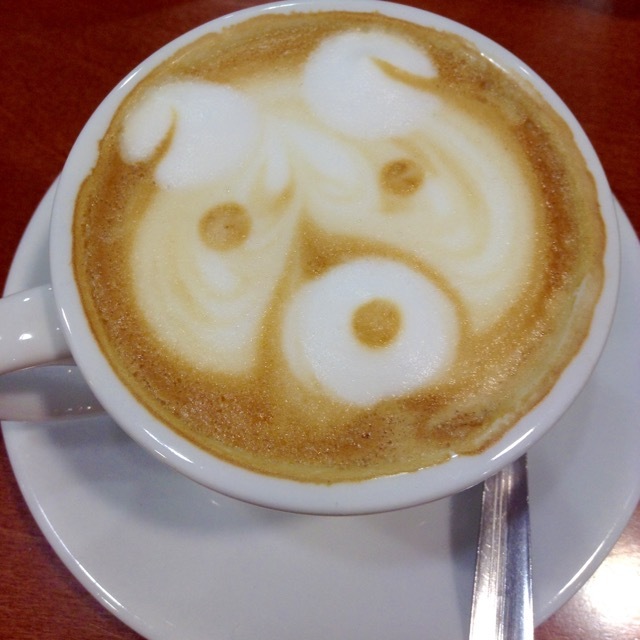 The best coffee in Santiago, hands down. Rather than using the harsh, roasted-with-sugar torrefacto coffee common across the country, Venecia baristas use only 100% Arabica beans, and the quality shows in their exquisite espresso. The owner, Oscar, has a true passion for coffee, and he will even brew some Chemex pour-over if you ask. The best chocolate con churros in town. 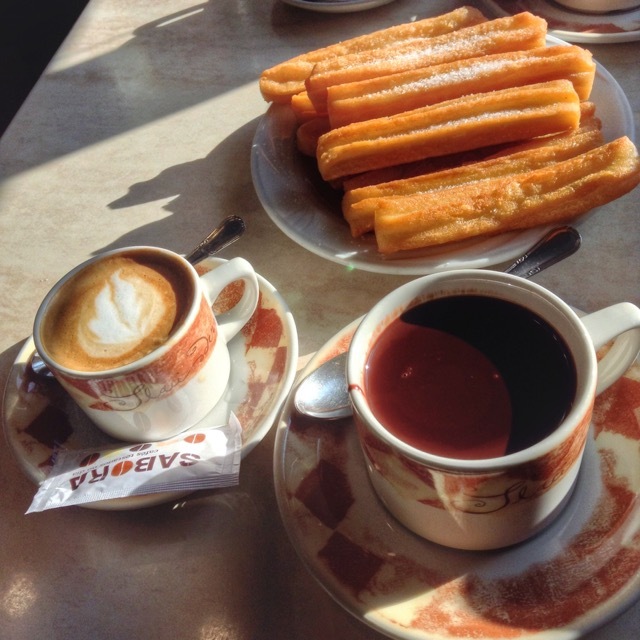 The chocolate is dark and thick, and the churros are always fresh, chewy, and sprinkled with sugar. This small joint at a busy intersection is almost always full, so make sure you get here early! The service is terrible, and the beverages are sub-par, but there’s no place in Santiago that can beat Costa Vella’s atmosphere. Set in a sprawling garden with trees, bushes, flowers, sculptures, a fountain, and granite stone walls, this hotel’s café is a secluded escape from that big city life. When it’s no longer absolutely dreary outside (or even when it is overcast! ), Costa Vella’s garden terrace is the perfect place for an afternoon pick-me-up. 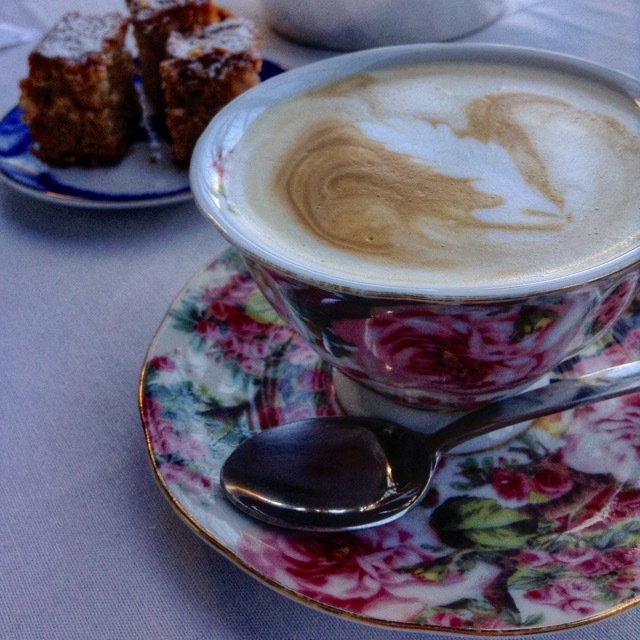 Come here for coffee in pretty floral cups served with fun little tapas of cakes and mini-cupcakes. If you visit in the morning or after lunch, you might be able to snag a seat out back on the patio, which has views of a peaceful forest (in summer) and the cathedral’s main façade (in winter). Although this place can get pretty rowdy late at night, early on it’s a great place to meet up for loose-leaf tea or a short cortado coffee. You’ll instantly fall in love with the quirky decorations, chill music, and free wifi. Whenever I want to write, I come here. Traditional Spanish café-bars are often too tiny, too loud, or too crowded to make you feel comfortable enough to get some work done on your laptop, but because the spacious SCQ extends onto a second-floor balcony in the back, the bright, main hall has quite a high ceiling. There’s always good (quiet) music playing and there’s lots of comfy couches and armchairs—plus many individual chairs and tables if you need to work on your own. Cupcakes! Need I say more? Moist, delicious, and how you would expect American cupcakes to taste. Tosta e Tostiña makes for a nice late-afternoon treat, and they specialize in Guinness cake and carrot cake cupcakes. Across the road from the mercado de abastos, Caylo is just your basic, everyday bakery/pastry shop combo. I would go here a lot during the All Saints weekend because the folks who work here had so many different flavors of huesitos de santos or “saints’ bones” marzipan pastries to choose from! A classy establishment in the new town with an old-fashioned interior that looks like it belongs in a turn-of-the-century salon rather than an ‘80s-era apartment block. You can get everything from pastries, to bon-bons, to ice cream here—but their plain, butter croissants are all you really need. Spelled to approximate the Galician pronunciation of the French word for bakery, boulangerie, this up-and-coming shop in the bustling zona nueva neighborhood abhors “industrial-style,” bleached-flour bread and instead favors traditional breadmaking techniques…and French pastries, too! La Bulanxerí’s artisanal bread will run you around a euro per loaf, as will their made-with-real-butter croissants. Just north of Praza de Galicia, this pastry shop has become my go-to place for traditional Galician empanada, or meat pie. This bakery’s empanada de bacalao con pasas is to die for: tender flakes of cod paired with caramelized onions and raisins. They also sell these things called glorias, but don’t go suggesting they’re cronuts (it’s a long story…). As the name would suggest, I’m always “tempted” to peek my head in to this tiny bakery on the old town’s main shopping drag, especially since the fragrant aroma of anise and orange blossom water is forever drifting down the street. They specialize in roscas, brioche rings topped with sugar crystals and candied fruit. Avoid the ice cream stands in the old town selling neon-colored stuff. This place, just a 10-minute walk from the cathedral back up the Camino de Santiago, dishes up excellent ice cream in flavors that change every week. I even got tarta de Santiago-flavored ice cream once…it tasted like peanut butter. Free. Tapas. Buffet. Need I say more? There’s a small handful of Basque-style pinchos bars in Santiago’s old town, but Antollos has the best bites (and the fewest tourists). Deep in the heart of zona nueva, Bar Latino makes for a great place to watch a soccer game with four different German beers on tap (plus Guinness) and some of the best calamares fritos (fried calamari) you’ll have in Spain. 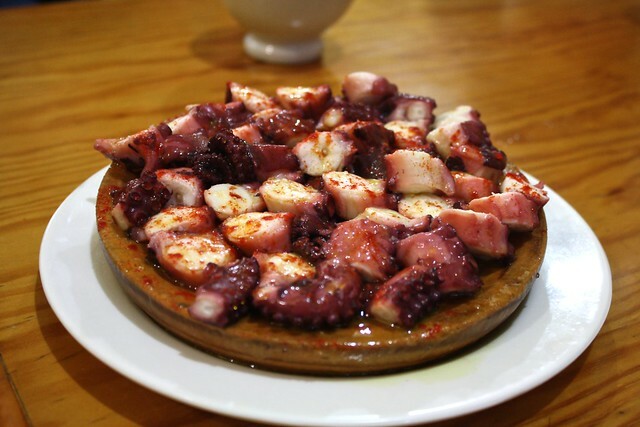 Your drink order comes with a large free tapa which often includes some of their famous fried squid. Yeah, I know, I already listed this in the “cafés” section above. 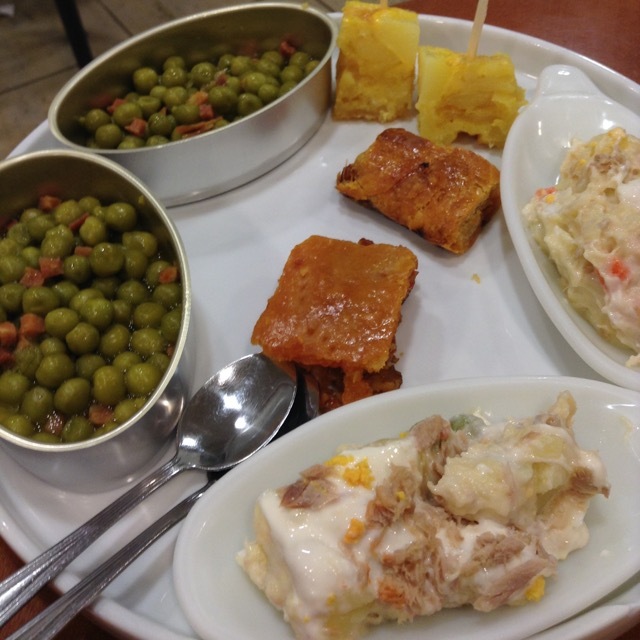 But I also enjoy Venecia’s fresh, homemade tapas they give you with your drink: it’s usually some combination of potato chips, potato omelet, stew, peas, paella, olives, or Russian salad. They close at 10pm, though, so come here while the night is still young. Ever had mejillones tigres before? Then you’ll love this one-stop shop. Never had mussels swimming in a spicy, tomato-based sauce? 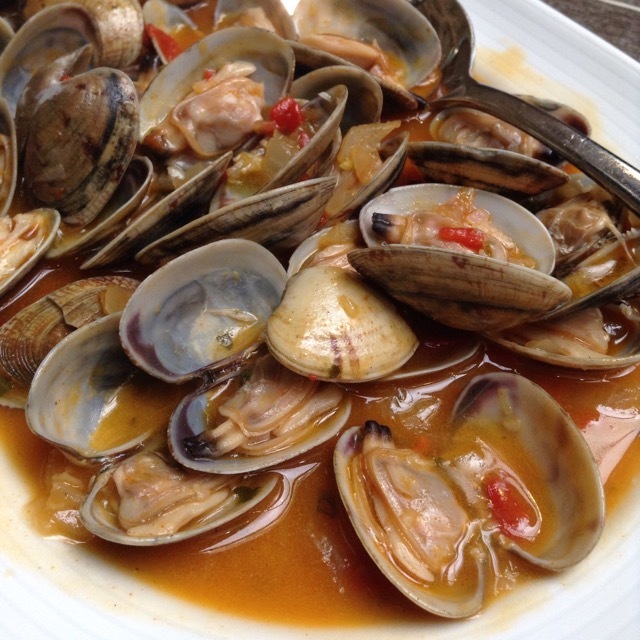 Then you, too, will love La Cueva, where you can use half a shell to scoop up a mussel and some sauce that is surprisingly spicy by Spanish standards. This restaurant serves the best Spanish tortilla in Santiago and one of the best I’ve had in Spain, too. 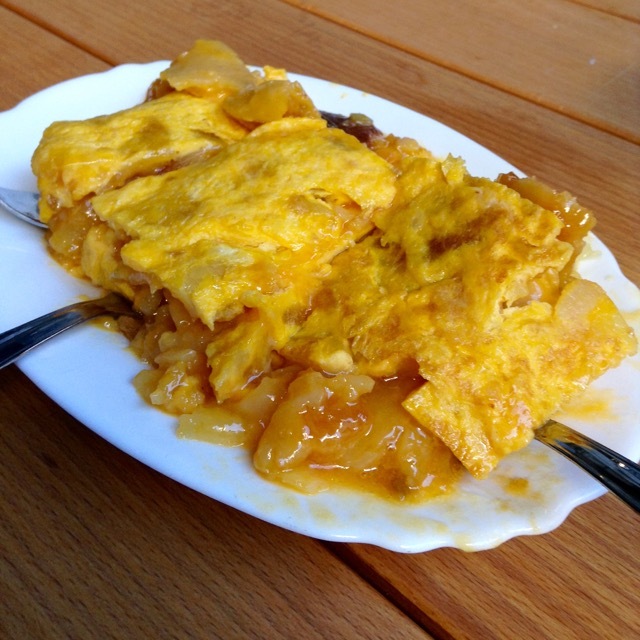 Cooked poca hecha or a little runny, as is traditional in Galicia, La Tita’s potato omelet comes out of the frying pan bright yellow, juicy, and always flavorful. You get a slice of their tortilla for free with whatever you ask to drink, but it makes a great breakfast option as well. Note: if their Nº 46 location is too crowded, they have an annex down the street at Nº 36 that serves the exact same food but in a much quieter dining room. This closet-wide bar, whose stone walls are lined with oxidizing pennies left by pilgrims, takes its name from St. James’ “white horse” that he supposedly rode into battle on. The free little-bit-of-everything plate of tapas that comes with your drink might not be all that exciting, but it’s the spacious terrace seating that makes Cabalo Branco really attractive. A dozen or so tables take up almost the entire plaza, making this a great place to get away from the crowds on a sunny day. Business up front: a cured meats and cheeses shop. Party in the back: a cozy wine bar facing a fireplace where you get freshly-sliced sausage and chorizo as part of the free tapa that comes with your drink. A nice, if crowded, place to escape from the rain on those typical Santiago nights. Just around the corner from the imposing Church of San Martiño, this bar-café is a quiet place to chill out with friends over coffee or tapas. They’ve also got a pretty decent selection of sandwiches and raciones (shared dishes) to choose from. I love the spacious, enclosed patio in the back, which is always pleasant and well-lit yet very dry so you get to feel like you’re outside but without the rain. This is one of those restaurants you’d never stumble upon by accident, hiding between a Neoclassical church and a residential street. They specialize in two things: setas (mushrooms) and revueltos (scrambled eggs), so I recommend trying one of each cooked with different ingredients to your liking. Their tender calamares (fried calamari) are superb, and are the best in Santiago. Make sure to get a seat at one of the terrace tables in the small plaza out back, which is peaceful and relaxing at night. Managing this unassuming hole-in-the-wall restaurant, bartender Manolo specializes in delicious bocadillos de criollo which refer to the chorizo criollo or peppery “Creole” sausage he splits in half, grills, and serves with a light chimichurri sauce. I’ve also had great family-style dinners here, with upwards of eight of us squeezing into the whole place, combining tables, and sharing dishes like tortilla or mussels in an escabeche marinade. They serve a bewildering array of cuisines here, from Lebanese to Venezuelan and even Thai, but I come here most often for their 3€ take-away kebab americano when my fridge is empty. When you need your Chinese food fix, come to China Ming. They’ve been in business since the early 1980s, and if you can’t decide what to order off of their extensive menu, the fixed-price menus for two or more people let you try lots of different dishes for an affordable amount. 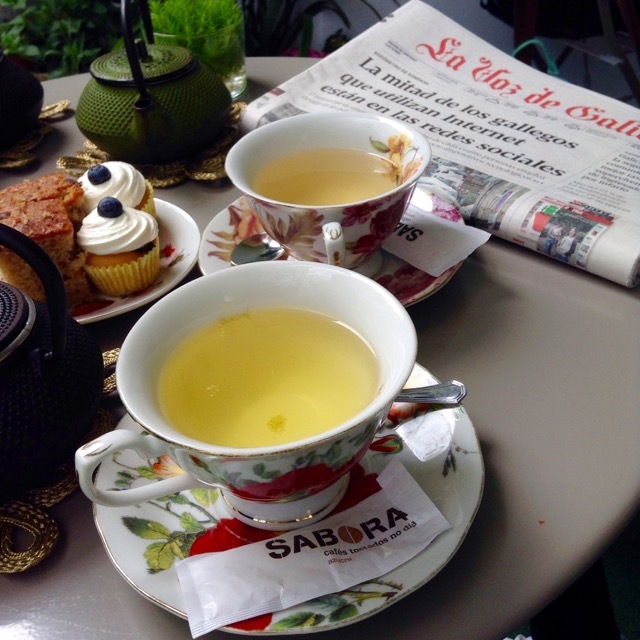 Not only does El Romero pour top-notch cafés con leche in the prettiest tea cups, it also doubles as an upscale restaurant perfect for starting a classy night on the town at. High attention-to-detail service, beautiful tableware, and, most important of all, rich, creatively-cooked meat and veggie dishes. Instead of the thin, flavorless patties shoved in a floury bread that you’d expect at a Spanish bar, the hamburgers they crank out at La Burguería meet American standards of authenticity since they use juicy 100% beef patties and spongy, glazed buns here. My favorite hamburger uses local Arzúa cheese melted on top. A classic sit-down restaurant in the heart of zona nueva that dishes up well-seasoned Galician barbecue (churrasco). They also offer dozens of simple but tasty raciones (shared platters) to choose from, ranging from basic salads and cured meats/cheeses to all kinds of seafood and grilled meats. Really nice wine selection, and the warm interior is inviting on a cold, rainy evening. A real gem crowning the northern edge of Santiago’s old town, Garum (whose name refers to the fermented fish paste the Romans used like ketchup) offers a fresh atmosphere where traditional ingredients like chestnuts and sardines are given modern spins. They’ve got an extensive selection of Galician craft beers plus a variety of different vermouths to choose from for your inner Spanish abuelo. My own neighborhood bar/café/restaurant, Da-Ca is strategically located with glorious views of Belvís Park. The family-run restaurant has a no-frills interior but the food is made with love, very affordable, and, most of all, very delicious. They offer everything from your basic bocadillo sandwiches to sprawling hamburgers with fried eggs to platos combinados or combo dishes with meat, salad, and fries. Super easy to get a whole meal, drink + free tapa included, for under 10€. And the owners are friendly, to boot! La Bodeguilla or “the little wine cellar” lives up to its name, with a vast wine rack to serve patrons in a clean, bright dining area. If you come here, make sure to order the pan con tumaca (moist bread with a tomato rubbed on it), Iberian cured ham, and the best croquetas you will ever have in your life. Although this restaurant may be a half-hour walk downhill from old town (take bus #1), I recommend this location over its sister restaurant in the old town (San Roque), as the latter is cramped and always mobbed by tourists. A fine old-town restaurant serving quality Galician cooking, plain and simple. Eat here for fresh, locally-caught seafood like ameixas á mariñeira (clams), chipiróns (fried calamari), and polbo á feira (Galician-style boiled octopus). Finish things off with a scrumptious plate of quiexo con marmelo or fresh white cheese with quince jelly. “The Black Cat” is one of the best restaurants in the old town, and for this reason the small, Spartan dining area is always PACKED so expect to wait 15-30 minutes for a table. Once you do sit down, make sure to ask for seafood like berberechos (steamed cockles) or mexillóns (mussels in marinade) and house specialties like chicharróns (shredded slow-cooked pork meat) and empanada (meat pie). One of my good American friends in Santiago has Indian parents and she can vouch that this restaurant serves legit Indian cuisine. I’ve gone here several times for huge, sprawling birthday parties and have not been disappointed with the quality and authenticity of the dishes served. Their irresistible naan (with or without garlic) goes great with palak paneer (spinach + cheese) or any of their chicken curries, and their lassis are very refreshing. I’ve put together a handy interactive Google Maps Engine map with all these cafés, bakeries, tapas bars, and restaurants that you can check out here! 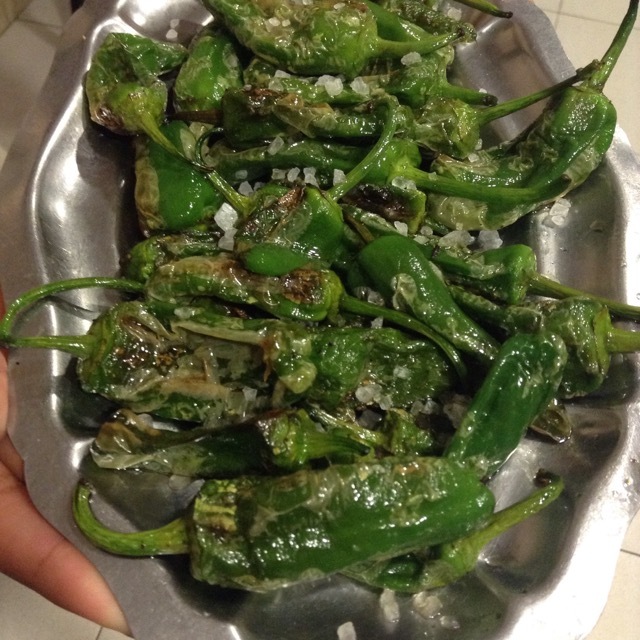 What’s your favorite restaurant in Santiago de Compostela? Which one on this list would you be most interested in trying out next? Tell me below in the comments!